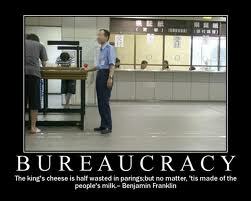 You Give Us a Bad Parking Ticket….Can I Give You a Bad Bureaucracy Ticket? 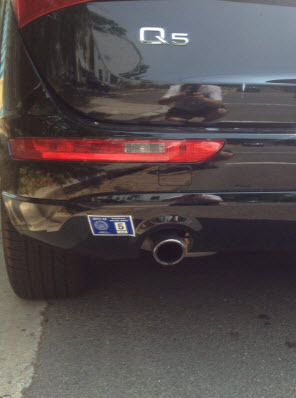 The city of Alexandria is very helpful with these stickers, telling you exactly where it must be placed on your bumper. This is so that said sticker is easily identifiable by any individual with even rudimentary color skills (it’s a nice, bright blue square). 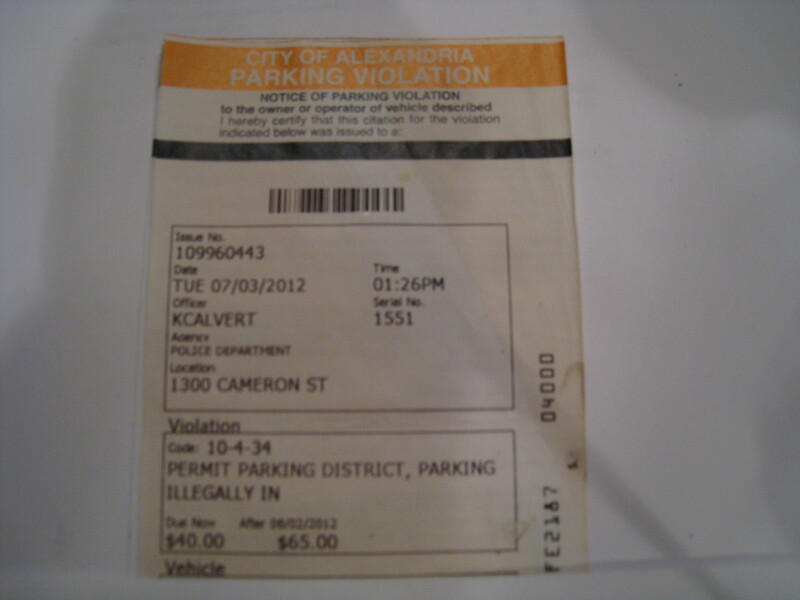 To make things even more fun parking wise, the city of Alexandria conducts street cleanings in Old Town once a week. So there’s one day a week where you cannot park your vehicle along a certain side of the street, despite having forked money for a permit to do exactly that. The day varies: for the side of the street that our house was located on, it was Mondays, so you could not park anywhere on that side of the street on Mondays. The opposite side of the street was Tuesdays. So you could not park on that side of the street on Tuesdays. This is especially awesome when you plan on being away on vacation. However, there is a totally inexplicable loophole here: Not every street in Old Town gets street cleaning. So, every time we went on vacation, we had to go in hunt of a parking spot on a street that was not street-cleaned. These generally were, of course, several blocks from our house. (Interesting sidenote: Our new house on our new street (also in Old Town) does not get street cleaning at all. As far as I can tell, there is absolutely no rhyme or reason to the Old Town street cleaning program. It varies completely from block to block). When we got back from vacation on July 5th, XFE dropped off his bags and walked over to retrieve our car, which had a completely shattered windshield and a July 3 ticket for illegally parking in a permit-only area. Two very bad things to come home to. We were, to say the least incredulous. XFE immediately began looking into the options to contest the ticket. He compiled evidence, including photos of the street sign that clearly states Permit 5 holders can park there and, photos of our car, including our current and legal permit sticker and license plate. He wrote a personal essay detailing why he should not have gotten a ticket, laying out all the evidence. The effort to contest the ticket was rejected by the city, with absolutely no explanation as to why, or what evidence was found lacking. Just a big waste of time. So XFE asked for a court date. That day came last Tuesday. We spent weeks going over the evidence, looking for possible loopholes, playing out any illogical scenario that might have the court side with the cop and rule against us. After all, there was money at stake here – including $63 in court fees plus $10 adjudication fee. If we lost the case, we’d have to pay an even larger fine than the original one AND court costs. It would just add insult to injury. We couldn’t find a single argument that would explain why the cop had not seen our permit, other than the fact that he did not even bother to look. XFE took that Tuesday off of work to attend court. I really, REALLY wanted to go as well, if only to put a face to this person who had put a ticket on a storm-damaged windshield. I wanted to glare at him and silently try to figure out what kind of person would do that. Alas, one of us taking time off work was enough. Nervously, I kissed XFE goodbye on Tuesday morning and wished him luck. I urged him to keep calm and collected. I cautioned him that if he did win, he should not, as he had been suggesting, offer the court a hefty bill for wasting his time and efforts in disputing the ticket. After all, if the city won, they’d make us pay for the court’s time and efforts, so fair is fair, right? The court has obviously put a value on the time that this whole procedure takes up: $63 in court fees plus $10 adjudication fees, so we should be entitled to the same, right? I made him promise he would call me immediately with the verdict. 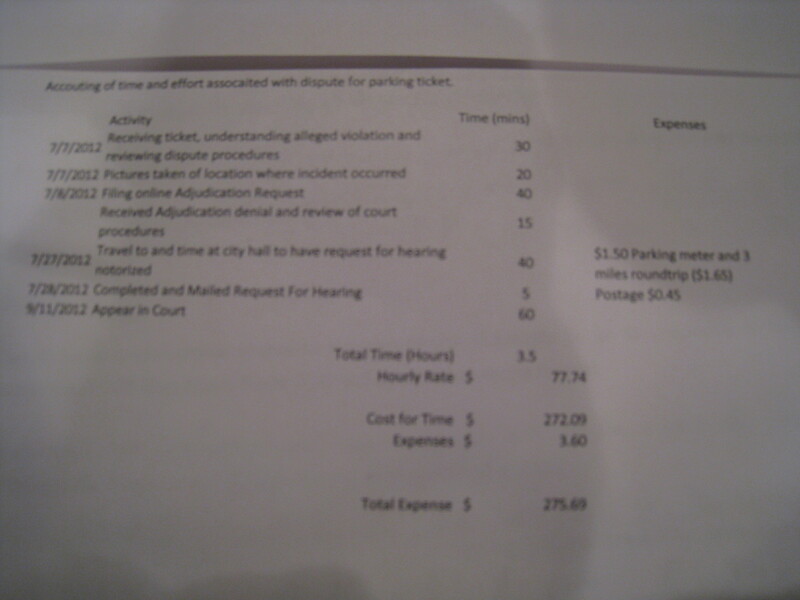 About 10 minutes after the appointed court time, XFE called and told me that the cop had not even shown up. 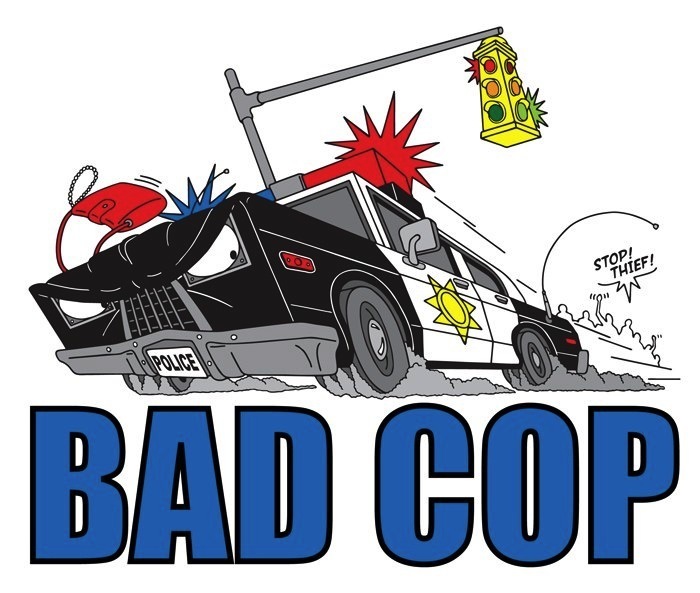 This cop did not even give us the respect of showing up and defending his erroneous actions. He will forever be just some faceless jerk, roaming the streets, giving out unjustified parking tickets. In my job, if I do something wrong, I have to admit it and apologize. I’ve got plenty of bosses to make sure that I own up to my actions, express contrition, and try to fix things if possible. But this guy? This guy doesn’t even have to stand there in front of us and the court, and say, “You know what? You’re right. I wasn’t paying attention. I was wrong. I should have done a better job. I’m sorry” He just gets to run around, writing tickets for legally parked cars and nobody says anything about it. And the rest of us have to take time off work and defend ourselves. So we weren’t exactly popping champagne bottles in victory. It’s hard to say justice was totally served in this case. Also: if any Old Town Alexandria City police are reading this, put down the parking ticket machine and please start looking for the individual who stole a brand new box of Adidas shoes off our front step. 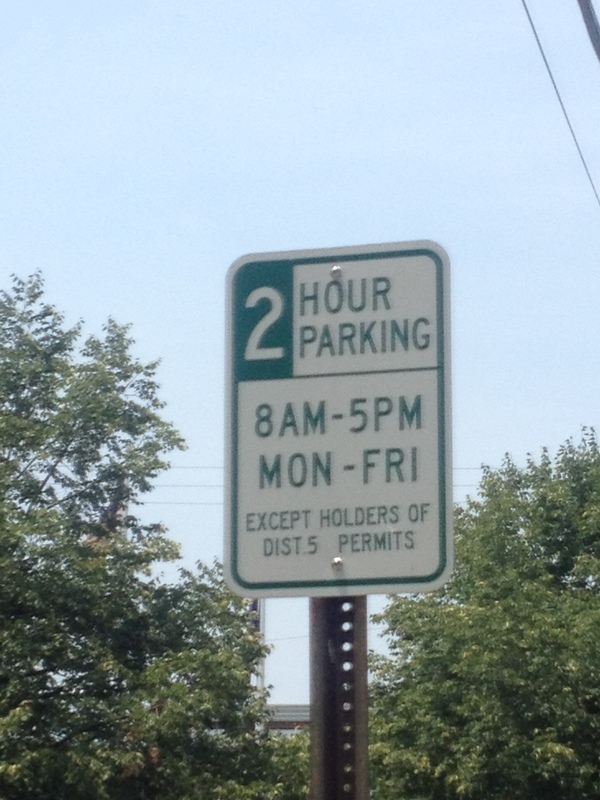 You can use the $30 we paid for our useless parking permit to compensate you for your time.